Billions of years ago, far across the universe, two massive black holes engaged in an eons-long dance, their mutual attraction drawing them closer and closer, until, in an instant, the two became one. At that moment, they emanated out ripples in space and spacetime with energy equal to three of our Suns. A century ago, Albert Einstein imagined just such a scenario in his head and in the mathematical equations on his blackboard, but he doubted humans would ever develop a way of measuring what he knew would be infinitesimally small disturbances by the time they reached Earth. But over the last 30 years, teams of scientists at the University of Florida, the California Institute of Technology, the Massachusetts Institute of Technology and dozens of other universities and research labs around the world have been developing just such a detector. It’s called LIGO — the Laser Interferometer Gravitational Wave Observatory. LIGO is a pair of 4-kilometer-long, L-shaped laser rangefinders – one in Livingston, Louisiana, and another in Hanford, Washington. A gravitational wave reaching the Earth will stretch one arm and squeeze the other by a mere ten-thousandth the width of a proton, knocking the laser beams inside them out of sync and creating a signal that can be detected. On Sept. 14, 2015, a computer program called Coherent WaveBurst developed by University of Florida physics Research Professor Sergey Klimenko, Professor Guenakh Mitselmakher, students and postdoctoral fellows was monitoring LIGO when it detected two signals, seven-thousandths of a second (0.007 second) apart, at the Louisiana and Washington sites. 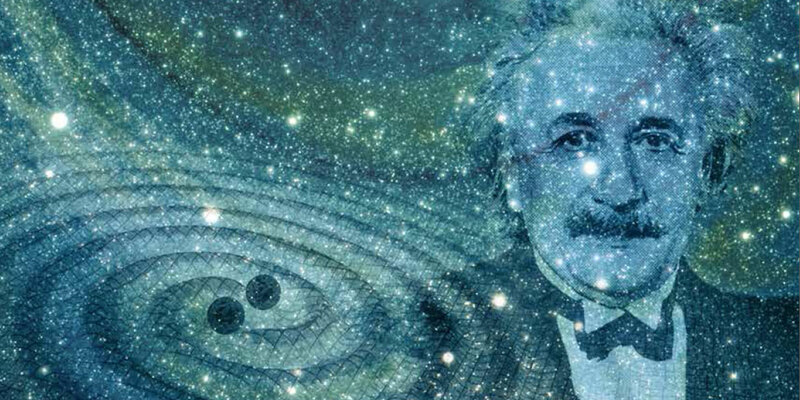 The signals looked like just what Einstein predicted, but they seemed almost too good to be true. In fact, LIGO was still only doing test runs after a five-year upgrade. Over the next five months, under the tightest security, LIGO scientists checked and rechecked their data, ultimately determining that the signals had to be from a gravitational wave. Using Einstein’s equations, they determined that the wave was caused by the merger of two black holes 1.3 billion light years from Earth. As the largest project in the history of the National Science Foundation at more than $1.1 billion, NSF wanted to make sure it was announced with fanfare. So they scheduled a news conference at the National Press Club in Washington, D.C. on Feb. 11, 2016, to coincide with publication of a paper in the prestigious journal Physical Review Letters. 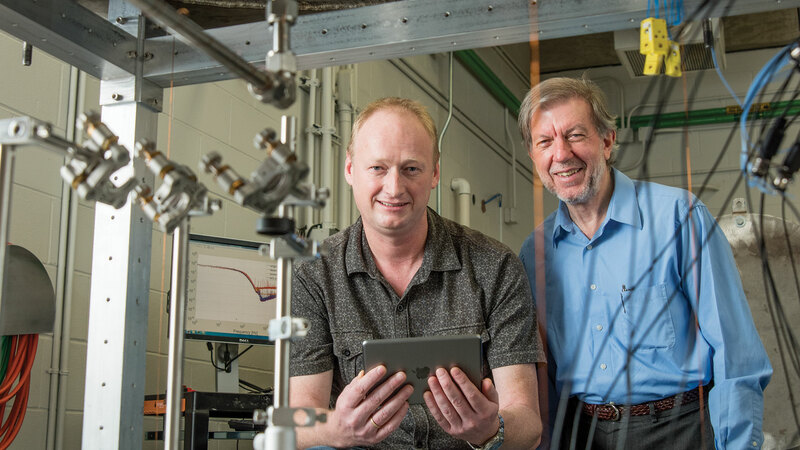 Professors Guido Mueller and Bernard Whiting with a scaled-down version of the LIGO optics. UF researchers first became involved in LIGO in 1995, when Mitselmakher approached his colleagues about a new project being developed by Caltech and MIT. Among those who responded were Reitze and colleagues David Tanner and Bernard Whiting. During a visit to the LIGO lab at Caltech in 1996, the four committed the University of Florida to produce LIGO’s Input Optics, one of the most complex and diverse systems in the entire interferometer. In doing so, UF was the first institution outside the original Caltech-MIT collaboration to have an essential role in LIGO. Since 1996, the UF group has received more than $15 million from NSF for LIGO-related research activities, including instrumentation, data analysis and gravitational theory. 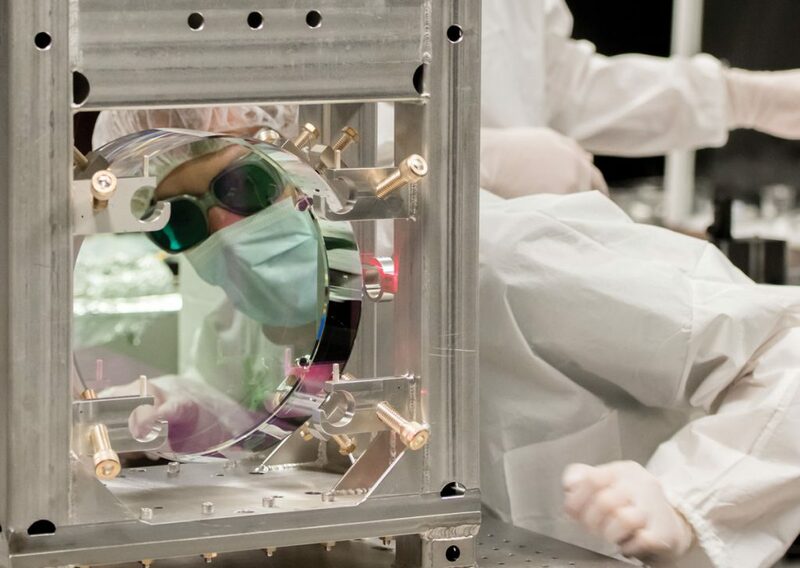 UF’s LIGO instrumentation team, led initially by Reitze and later by Professor Guido Mueller, has also received $4 million for the design, construction and installation of the input optics of the initial LIGO detectors and nearly $6 million for the Advanced LIGO input optics. The Advanced LIGO detector construction was completed in late 2014. An “engineering run” began in late August 2015 so that scientists could study detector performance and, if necessary, make small changes to procedures and operating conditions. A full “science run” was scheduled to begin in late September. Although still in test mode, LIGO was listening to the universe using Coherent WaveBurst when at about 5:50 a.m. Eastern Daylight Time it heard a signature “chirp,” as described by Reitze and Gabriela Gonzalez, a physics professor at LSU and the LIGO spokesperson. Within minutes, Coherent Waveburst sent an e-mail to Klimenko and his collaborators, notifying them that it had detected an event. Klimenko was halfway through his first cup of coffee when he saw the e-mail. Klimenko says the speed with which Coherent WaveBurst detects a signal and notifies researchers is key to detecting and understanding gravitational waves by linking LIGO observations to other astrophysical “messengers” such as light waves, cosmic rays and neutrinos. UF physics researchers continue to improve optics for future detectors in the department’s clean room. The program calculated the rough sky location of the September 14 event within minutes and reported it to LIGO partner telescopes around the globe. Since only two detectors were operational it was only able to narrow the location to a swath of sky in the Southern Hemisphere, but when a third detector goes on line in Italy later this year, the three will be able to triangulate gravitational wave events much more precisely. This will allow UF astronomers like Stephen Eikenberry, who joined the team in 2011, to use astronomical telescopes — including the Gran Telescopio Canarias in the Canary Islands of which UF is a partner — to identify and study light from the astrophysical sources generating the waves. Klimenko, Mitselmakher and Whiting have also developed algorithms that promise to greatly simplify the challenging task of sorting through millions of astronomical images of stars and galaxies to identify the one object which corresponds to the gravitational wave event. These algorithms apply advances in computational data mining and machine learning, coupled with detailed UF simulations of the LIGO detector response to gravitational waves, to make this task faster, cheaper and easier to apply to a broad range of telescopes around the world.